A new bar and restaurant has opened in Brisbane's entertainment hub inspired by New York street food. 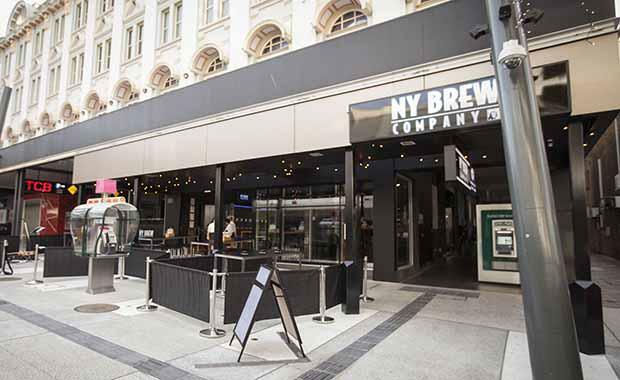 The New York Brew Company is located in the TCB Building in the Brunswick Street Mall which has been transformed to pay tribute to the raw appeal of New York. New York Brew Company owner Todd McGregor cites the Big Apple’s spirit of aspiration and optimism as the inspiration behind the bar, which will also be evident in the projects underway on the bar’s doorstep. “We’ve created a sophisticated venue of class and distinction that takes the best elements of what New York offers and puts a Brisbane twist on it,” he said. The drink menu includes both locally crafted and imported beers as well as high quality cocktails reminiscent of what is offered in the city that never sleeps. The food menu draws inspiration from typical New York street food with an added local modern spin of restaurant quality. New York Brew Company FoodThe position of creative Head Chef has been appointed to Adam Clements who previously worked in Brisbane restaurants including The Regatta and The Story Bridge Hotel. Mr McGregor said the intention of the new bar was to showcase Brisbane’s own version of New York. “We wanted to bring New York style eating and drinking to Brisbane and do that in an authentic, grown up way,” Mr McGregor said. He draws from his experience of working for Connecticut based companies and sampling food while in Manhattan.